Two wins in a row for you and on a track you probably couldn’t push too hard on. The track was definitely slippery. They got it better for the night show, it had a little bit more traction, but it was still slippery. It was easy; everybody was doing the same thing. Tell us about the triple after the finish. I did pull that, but I think it was two laps later and they all started hitting it. They were going outside and kind of bouncing off. One lap I wheel-tapped it and I was scared; I barely caught the top. I was like, “I’ll just triple and hopefully I’ll make it work,” but it was good. 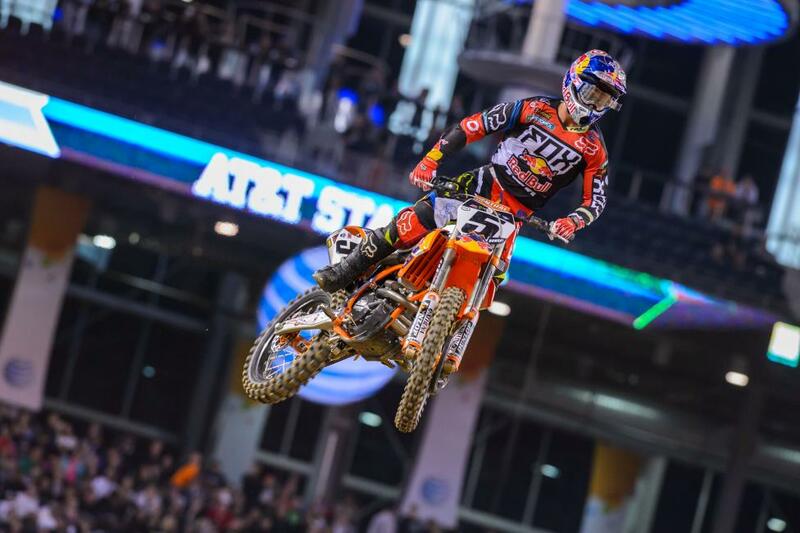 I got around [Ryan] Dungey and just rode some good laps. He stayed there; he kept me honest the whole time. I was able to just kind of squeeze away at the end. 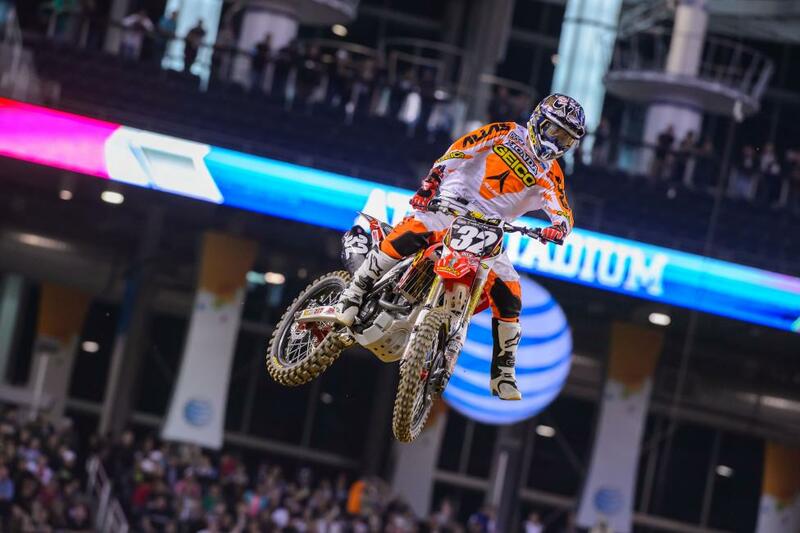 Early on where did you think you were catching Dungey and making up time on him? Was there one spot? We all thought it was going to be really tough to make up time on this track, because you can’t push. But was there one spot where you noticed you were catching? My corners. My corner speed was really good tonight. Before the triple I had that corner down. It’s obviously easier when you’re in second, but I would say my corner speed was where I was able … We were doing the same thing through the whoops, he rode down the middle, and then dragon’s back was the same. Before that I wasn’t even jumping the triple-triple—so just corners. Pulling close to the lead, marking those points off, got to feel pretty good right now going into Atlanta and Daytona. Welcome back to the podium. That’s awesome. It had been a couple weeks. We had a little bit of ups and downs since Phoenix. But it’s been good. We had a good week. The week has been awesome. It’s just been a competitive class. We got a good start tonight and it would have been nice to keep going with that win, but at the same time I thought it was really good. When you weren’t on the podium, do you even feel like you were even riding differently or was it just circumstances—guys are fast, starts, falls, whatever? For sure it’s the starts. You can put yourself in a good position early on because you know, the class is so stacked. There is so many guys that are going to be right there. And the tracks aren’t very technical. Everybody’s doing the same rhythm, the same stuff, so when you’re behind five or six guys and you’ve got to make all those passes, it doesn’t really work out so good. You get caught up in guys and then they try running you high, then you lose time on the leaders. It’s just one thing after another. Like I said, Stewy, he had some better lines than me. When he got around me I was looking to pick up on them. And we kind of stayed the same distance throughout the rest of the race, but it would have been nice to be closer to him in the beginning. We could have opened up a little bit better. But we know now and we can just take from it and build. Do you know about “Angry Dunge”? Are you aware of this? [Laughs] No, there was just a wanting to do good! Were you trying to be more aggressive at one point? Not necessarily more aggressive, just trying to raise the intensity more. Like I told everybody else, the heat race, the first one [in Anaheim 2 where Dungey ran into Josh Hill and Broc Tickle], they take top four. Guys are gunning just to get into that, and it’s a six-lap race. So the intensity’s higher and you have to make those passes happen quick. So with that being said, that’s all I was trying to do. And then we had a couple tip-overs and stuff like that. But it’s nice to rebound tonight and get back to the East Coast and keep up on the starts. No, I never went to the line saying that. Just trying to make things happen and do my own deal. You find yourself in a position and you need to make stuff happen. The guys would do the same thing to you. But there’s the problem. A couple of those races, actually, the results weren’t as good as the first two, so it’s a thin line. 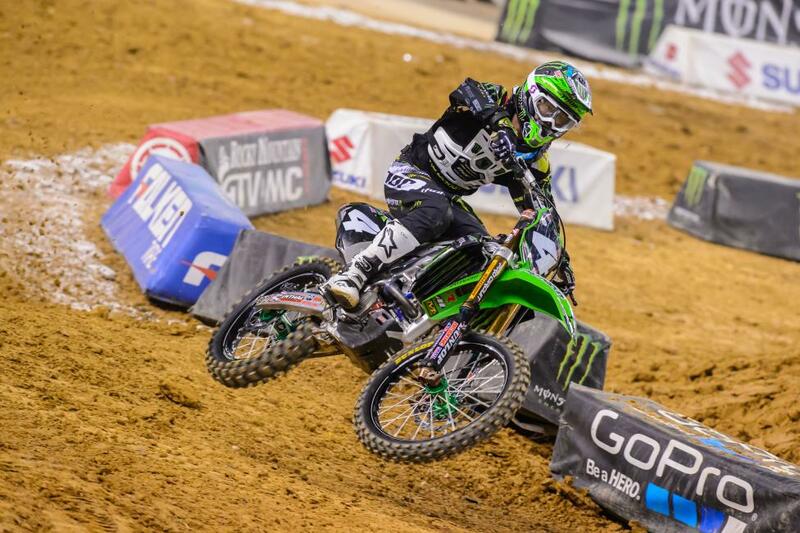 Okay, so once again, can you ride supercross? Are you good at it? Did this help? [Laughs] I didn’t win, so evidently not! It was pretty good though. You haven’t rode supercross in quite a while if you think about it. Pretty good? It was first loser so I guess it would be pretty good. Well you want to say it was great? Super? 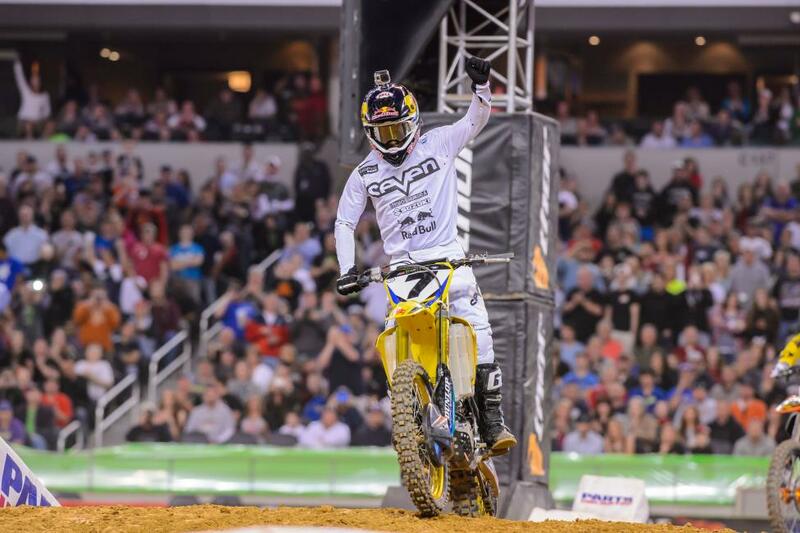 You didn’t race supercross all last year. Second is good. This whole race came down to mistakes. Are you happy? Do you feel like that’s a little bit closer to where you had been? Last week you had a crash, Anaheim 3 wasn’t great. Last week I crashed but I still felt like I was riding really good. It’s good to be back in the top five, good to get a good start. I felt like I was good enough to get third tonight for sure, just that one mistake. Jumped off the track after the finish and messed up that rhythm after that and it cost me three spots. It’s just how close the top six … we’re really, really close right now. I ended up passing back into fifth, so a decent night. Like I said, I want to be on the podium so bad. I miss that feeling. Looking forward to Atlanta though. Feel like it’s pretty much my home race now, so looking forward to that. I think we’re somewhat happy with fifth. You had the gate pick from the semi, right? Was that really that bad or did it not make too much of a difference? How’d it go? Obviously you had that injury from last week or two weeks ago. I haven’t been riding in a week and all that aside, for what the cards have been dealt, I’m happy. I had more in the tank, yeah, but like I said, the cards that have been dealt these last two weeks I’m fine with it. I’m really happy to even be racing tonight. Totally. It’s no different than being on the Lites bike but there’s just another benefit of being on a break right now like they would be, and we don’t have that for a long time yet. So I’m happy about it. Just getting my hand back to normal this week. I’m excited about it. Do you think you’ll be able to ride this week? You came in behind the 8-ball a little bit, then you had to go to the LCQ. So all things considered, you’re fifth and you’ll probably take it. You’ll leave here happy? I’ll take the fifth. I’m still in the title chase and that’s really the important thing. I got another eight weekends to build here for the end goal, which is really all that matters. The heat race was pretty pathetic. It was pretty embarrassing. I actually tweeted “Bogle last,” and then I watched you for half a lap. I said, “Something’s wrong with his bike.” Seriously that was the worst first lap I think I’ve ever seen. Start to finish, your best race of the year. Yeah, it was good, the best day. I’ve been riding really good during the week the last couple weeks. Now that I’ve got more time on the bike, on the new Yamaha, I’ve got more comfortable on it. The last two weeks I haven’t really had to change anything so I’ve been able to just ride during the week. Riding good, lap times are good at the test track and everything. Just the last couple weeks I’ve been feeling good during the week and not bringing it on the weekend. I just kind of get in there and I’m just not confident in myself, not jumping stuff I should jump as quick, and just not feeling confident in myself, more just a personal thing. So this weekend I just said screw it, I’m just going to go out and ride like I can and not worry about anybody else and it was better. It started out better with practice and just kind of carried through the day. So definitely hopefully a turning point, we can just keep getting better, get into that top ten where we should be, just keep working. I’m going Florida from here so I’m looking forward to that. Hopefully Chad [Reed] is okay, my riding partner. Hopefully he’s doing okay. I know, it definitely wasn’t what we wanted after coming off of two top fives, but racing’s racing. It ain’t always going to be perfect every single weekend. I just got a little out of control on that one rhythm section. I cross-rutted a little bit and just barely clipped the hay bale. My brake pedal just locked up and I endoed and took a little digger. Got back up slow. I think I got back up into the top 15, 13th or something like that. Then I think we had four laps to go and Nicoletti wadded in front of me. Same section, same jump. I landed over the triple straight into him, endoed another time, messed up my leg and my shoulders, but whatever. Just build from here and show up next weekend and do what we’ve been doing.